Remove hair and inhibit regrowth with Skin Doctors’ Hair No More Hair Removal System Pack: a two-step system that both removes unwanted hair and weakens its regrowth. Goodbye hair, hello long-lasting silky smooth skin! 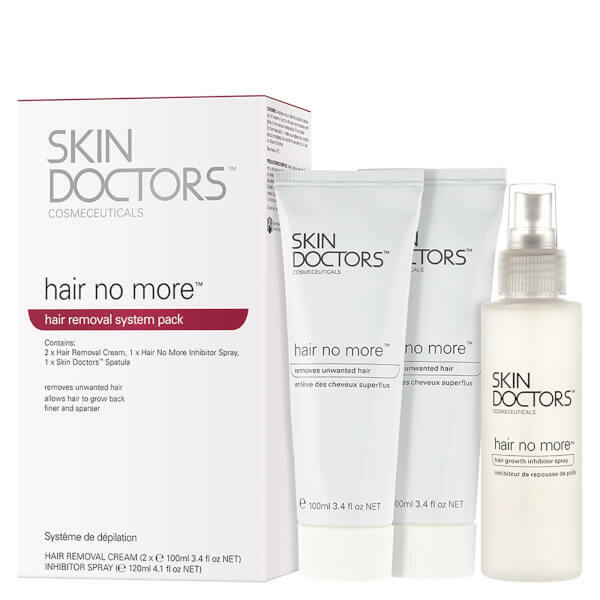 Skin Doctors Hair No More Hair Removal System Pack contains a hair removal cream and a scientifically developed hair growth inhibitor spray that harmlessly and painlessly removes unsightly facial and body hair, helping it grow back finer, sparser, lighter and slower. In phase one, the pleasantly fragranced hair removal cream dissolves the proteins that make up hair, literally melting the hair away. In phase two the scientifically developed liquid inhibitor spray gets into the pores of the skin and saturates the hair bulb. The liquid starves the hair at the root and prevents hair cells from germinating. Active ingredients include calcium thioglycolate which efficiently dissolves the proteins of the keratins in the hair without any burning sensation or skin irritation; soothing and moisturising aloe vera to help rebalance the pH level of the skin; and allantoin, to help soothe the skin and stimulate the growth of healthy new tissue. 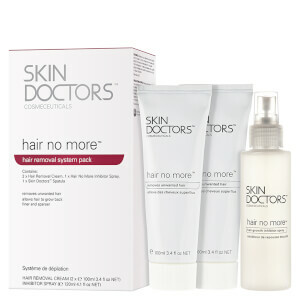 Skin Doctors’ Hair no More Hair Removal System Pack is kind to your skin and promises great results. Patch test a small amount of Hair No More on the area to be treated. If no irritation occurs commence with full application. Apply Hair No More cream in a thin even layer. Do not rub in. Leave for 2-3 minutes (face), 4-5 minutes (body) then remove a small area of the cream using the spatula. If hair comes away easily the cream has been on long enough. Some hair may need another 1-3 minutes. Do not exceed 5 minutes for the face and 8 minutes for the body. Once the hair has been removed, rinse any traces away immediately using a soft cloth and clean cold water. Do not use soap or other astringent lotions, antiperspirants or perfumes for 24 hours. Once the skin has dried following depilation, spray the treated area with a fine mist of the Hair No More Inhibitor Spray. Massage in until fully absorbed.